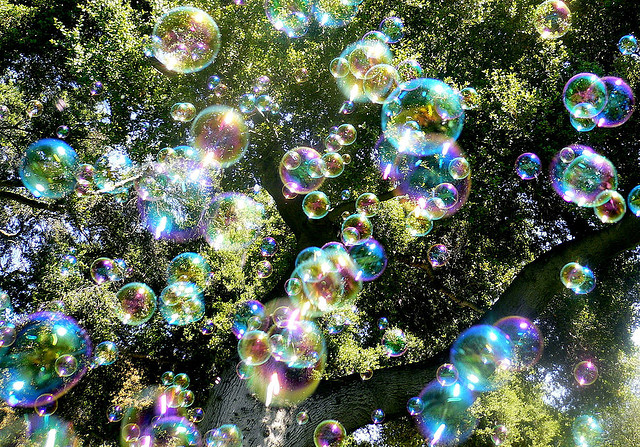 Bubble Rain. Source: Steve Jurvetson, Creative Commons license. Reza Aslan has had an interesting week in the limelight. A few days following an appearance on Real Time with Bill Maher, he became the newest viral video sensation when an “interview” he did/was subjected to on Fox News garnered an impressive level of coverage, for both the stupidity of the questions he was being asked and his unflappable calm in responding to them; akin, as some have observed, to a teacher instructing a babbling child. As he mentions in the clip, Aslan is an impeccably credentialed academic who has made a career of studying and writing about religion, and so, to be interrogated repeatedly by a person whose education beyond fourth grade is dubious (at least based on this clip), “why does a Muslim want to write a book about Christ?” is probably the intellectual equivalent of being asked who he’s wearing on the red carpet tonight. The embarrassing affair veers further of the rails when she begins badgering him about why he hasn’t revealed that he’s a Muslim before (he has, on multiple occasions), as she panders to that sizable portion of the Fox demographic that presumes Muslim = al-Qaeda. The blatant anti-intellectualism would be galling if it weren’t so unsurprising, if one did not have to assume that the interviewer’s questions were prepared and approved enthusiastically (with frat boy giggles, in all odds) by a cynical producer seeking to perpetuate an insular, terribly biased view of the world for the benefit of Fox’s ratings. Bill Maher is fond of pointing out that conservatives live in a bubble where they cannot accept anything that challenges how they choose to view the world. It is quite possible the person conducting the interview with Aslan was so committed to this mindset that why a Muslim would write a book on Christ simply would not compute. When you sacrifice the scary world of the unknown for the comforting confines of dogma, of course the curiosity of others becomes impossible to understand. That’s why you get members of Congress (on science and technology committees, of all things) claiming defiantly that we don’t need to worry about global warming because God promised Noah he would never flood the world again. But this notion that one should stay inside the lines, refrain from asking questions about things we don’t understand and (horrors!) actively explore topics that interest us despite their seeming to have no relation to our own lives, goes against the very notion of human progress. If we don’t venture out of the cave we don’t discover fire. If we presume that the earth is flat and there is nothing beyond the ocean sea, I’m writing this post in England right now (actually, I’m probably scrawling it in ink on parchment). If we accept that the moon is made of green cheese we don’t have Apollo 11. We have to ask questions about things that are foreign to us. We have to examine viewpoints that contradict ours. In the case of persons of faith, it’s what strengthens that faith – for unchallenged it is not faith at all. For those of us who choose not to walk the religious path, it’s gathering those elusive nuggets of truth that help us sort out our own thoughts on What It’s All About. And that sometimes means examining religion too, even if Fox News can’t understand why we would do it. Curiosity is a trait borne of hunger, from a dissatisfaction with the distasteful notion of accepting things as they are. Being unwilling to accept limits. Curiosity is what makes us smash through those limits with an iron fist and reach for what’s hidden on the other side. You never know, it might be something good. We are fortunate to be living in this time, when the world has geared itself like a finely-tuned clock toward the indulgence of curiosity, when information is readily available to those who seek it out. The human thirst for progress has led us here, centuries from the era when the Fox News illiterati whom we now laugh at with millions of snarky voices were once those who would have had us burned at the stake in a heartbeat for uttering a single syllable against their ridiculously narrow view of the cosmos. Millions of opinions on just as many issues are published every single day and we are free to sort through the noise to find the songs we want to add to our ever-expanding repertoire. Why would a Muslim want to write a book on Christ? Because he can. And we should want to read it for the same reason (in a happy ending for him, Aslan’s book Zealot has hit #1 on Amazon’s rankings this week). That’s how we learn. Which, one supposes, is the real danger to the folks like the purveyors of Fox News who rely on closed minds to replenish their bank accounts – fill a bubble with too much knowledge and it bursts. Something different this morning. Offered without comment for your appreciation and reflection, the ageless wisdom of Isaac Asimov. Hat tip to my friend Tadd. And he was a Star Trek fan too.